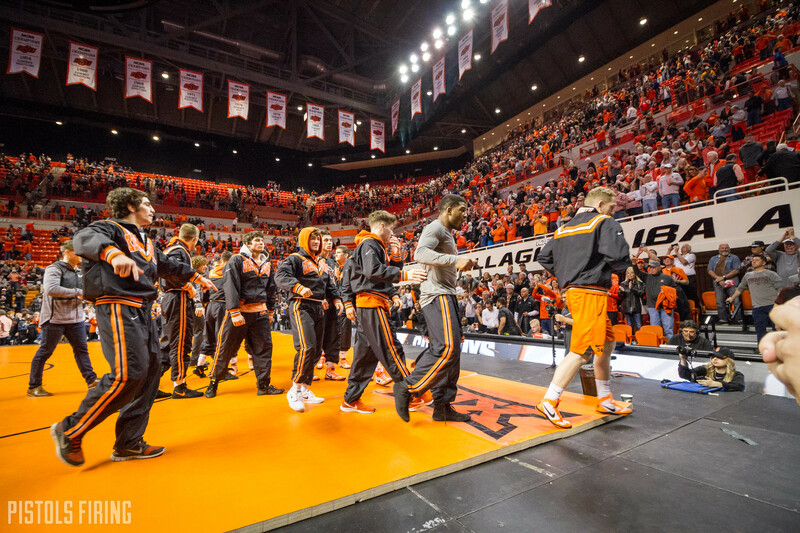 A look at OSU’s upper weights for next season. A few weeks ago I took a look at the potential lineup from 125-157 next year. Here’s how things could break out in the upper weights for the Cowboys. 165: Two-time All-American Joe Smith closed out the season as the starter at 165 and could return to man that post again next season. After a season where he spent the majority of the season at 174 that weight is also a possibility. If Joe goes up to 174 there are a lot of things that could happen at 165. Andrew Shomers started this season at 157 and moved up to 165 after he no longer could make the weight cut. There is a big group of freshmen who will be coming off their redshirt seasons at this weight and of that group Colt Denney seemed to have the edge. Denney won three tournaments early in the season all that had most of the other 165s in the field. One other possibility I’d throw out here is Travis Wittlake. Wittlake was one of the top recruits in the 2018 class and wrestled his redshirt season at 174. He isn’t what I’d describe as a “big” 174, though. If Joe Smith opts to wrestle up at 174 could he cut to 165? I think it’s a real possibility. 174: With all the scenarios mentioned about 165, 174 is probably Joe Smith or Travis Wittlake. I ultimately think it’s most likely to be Joe at 165 and Travis here, but do think we could see some of the variables already mentioned shake this up a bit. If Joe is at 165, 174 will be between Wittlake and Christian Bahl who spent some time in the starting role this season. 184: At 184 we could see the return of All-American Dakota Geer. We could also potentially see him move up to 197. In an interview I did with Geer last year he mentioned that may be the plan. If Geer stays at 184 he’ll be the guy. If he goes up to 197 I think we see Redshirt freshman Anthony Montalvo here. Montalvo was a bit of an under-the-radar recruit that really blossomed late in high school. He had a decent showing in his redshirt freshman season and if he continues to progress he could do some damage at a weight that graduated a lot of seniors this season. You’ve also got Junior Greco World Team member Bear Hughes who made a few starts here this past season. 197: This weight will be interesting. Geer could bulk up to 197, so could Montalvo. And Andrew Marsden will be a senior and has spent time in the starting role here off and on throughout his career. Of the two 184s Geer has the frame best suited to fill out 197. He’s also a potential title contender at 184 and may prefer to stay down. If Geer chooses to stay down would Montalvo try to bulk to 197, or even just stay small and wrestle up? If he does, would he beat out Marsden for the job? There’s lots of intrigue surrounding this weight this offseason. 285: With NCAA runner-up Derek White graduating, the Cowboys only have one true heavyweight on the roster in Cornelius Putnam. Redshirt freshman and Double Junior Pan-Am Champ Austin Harris is a 197, but has shown some interest in potentially going the “bulk job” route we’ve seen recently with Derek White and Austin Schafer. As it stands today it’s between those two for the job.